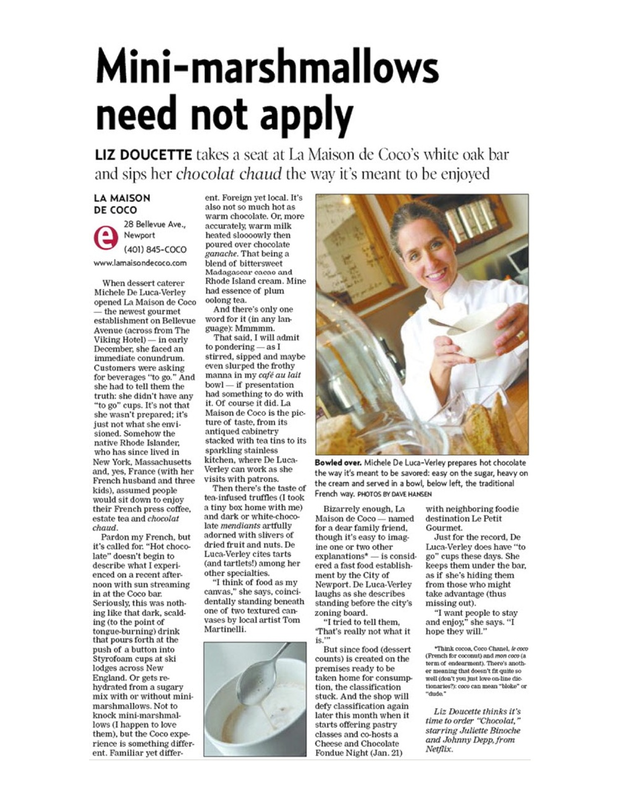 Newport: Michele De Luca-Verley has a bewitching way with the artisanal chocolates that she makes for La Maison de Coco (28 Bellevue Ave., 401-845-2626, www.lamaisondecoco.com). She crafts her tea-infused truffles daily with fresh cream from a nearby dairy. Customers find the flavor of the caramel truffle comfortingly familiar, but as a winter warmer, De Luca-Verley recommends the ginger truffle or one she calls La Forêt (cinnamon and plum). For gifts, picnic snacks and pick-me-ups, try Bellevue Avenue’s Gourmet Trio. You’ll find high-end, tea-infused truffles (in flavors like bergamot and jasmine peach blossom) and white chocolate and lavender hot chocolate at La Maison de Coco (28 Bellevue Avenue; 401- 845-2626;lamaisondecoco.com), artisanal cheeses and local Aquidneck Honey at Le Petit Gourmet (26 Bellevue Avenue; 401-619-3882) and weekend wine tastings at the Newport Wine Cellar (24 Bellevue Avenue; 401-619-3966;newportwinecellar.com; 4 to 7 p.m. Friday and Saturday).